I always regarded audio books as odd and an extremely slow read. Slow for sure, but when English is not your first language audio books sort of makes sense - having the author read the text really adds something. If nothing else, it's good training. This is from 2002. 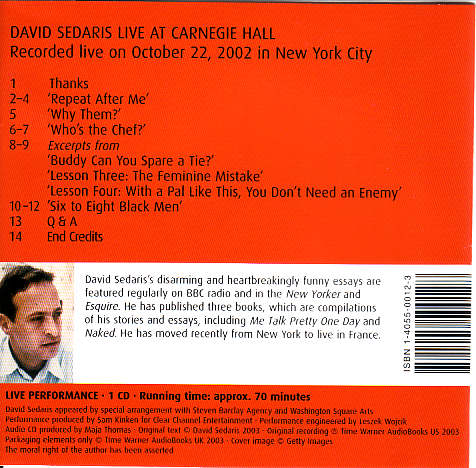 Some material I've read in Sedaris' books but I think this cd is pretty nice anyway. There's some audio clips at NPR. Content updated 10 March 2019. <URL: http://boralv.se/blog/?id=1151331445>. This server is able to calculate 24.4 pages like this per second. No computers were harmed in the making of this page. CSS Validator, HTML Validator.